As part of the Centenary celebrations for Woolacombe school, on Tuesday 21st June, we held an exhibition of children’s art work at Woolacombe village hall. All 7 classes produced superbly colourful and varied art work, on themes connected with our community and our coastline. Parents and other visitors from our community commented on the high level of creativity, and the children were thrilled to see their art work so prominently displayed and so highly appreciated. Parents were invited to ‘buy’ their child’s work, which was also very exciting for the children. Alongside the exhibition we ran a competition for the children to work on at home, and we had 57 entries from across the school. Ranging from simple pencil drawings and paintings to large scale models of our beach, mobiles, collage and driftwood sculpture, all reflecting our community and our centenary in some way. The competition was judged by local artist Steve PP, and he was blown away by the variety and standard of the whole exhibition. “I read somewhere that the job of an artist is “to show people what they don’t see.” “I have just had the pleasure of being shown something that I paint and see every day, in a fresh, new vibrant way, through the eyes of 200 very talented artists from Woolacombe Primary School. This little school in my village by the sea has a fantastic art department with teachers that put a lot of time, love and passion into encouraging the children into the world of making and enjoying art. The variety and wealth of techniques and mediums used really impressed me. Well done to all of the talented artists, a fantastic exhibition of passionate, uplifting colourful, coastal inspired art. You made my day, and got me thinking about my own work in a fresh and exciting way, thank you!” Just before half term we also worked on a large scale collaborative mosaic to celebrate our special birthday. Children and parents worked in small groups throughout the week with local artist and art teacher Clare Russell to create a large colourful mosaic, which is now prominently displayed in the school grounds…..hopefully it will still be there in another 100 years !! Sloop the Seagull – The seagull who was scared of the sea! I’m Ruth Cooper; I’m 32 and live in Sheffield with my fiancé, Martin and our 2 year old daughter Florence. I am a full-time Mum. In 2014 I self published my first children’s picture book called Sloop the Seagull who was Scared of the Sea. My Mum, Julie, is the illustrator and lives in Rotherham with her husband, Paul and two dogs, Beau and Amos. For as long as I can remember our favourite place has been by the sea and for me the love for it started as a child. 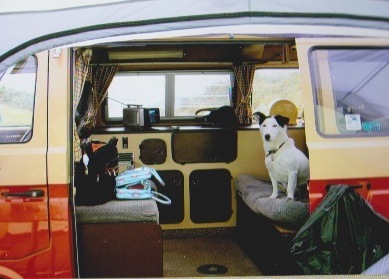 I adored our family holidays camping and caravanning, in places such as Whitby right down to Lands End. Everything from the sounds to the smells of the coast captivated me! When I first visited Woolacombe and Mortehoe with my friend, Jackie, we had spent several long hours on a coach and had no idea what to expect. We needn’t have worried though – we were blown away! It was a beautiful warm morning and the scenery was stunning as the taxi drove in – from then I was just excited. My parents had been trying to get me to go for years as they have an equal love for it. I have now been visiting for about 8 years; Martin and I had our first holiday together there, Flo her first Holiday ever and we recently booked our wedding at the Watersmeet Hotel! It’s magical, from the quaintness of Mortehoe, right down to the surfy vibe in Woolacombe. I’ve enjoyed walking over the cliff tops to Lee and where possible climbing back over the rocks feeling like an adventurous dare-devil. Learning to surf was exhilarating – I can just about stand up now! Martin and I would reward ourselves afterwards with chips and a cold drink from one of the vans on the beach before burning it off with a run down the sand dunes. I love how it is full of wildlife and seal spotting from Morte Point has to be one of the most rewarding and relaxing pass times ever. I have several favourite views; one of them has to be when I am in the sea looking back at the beaches and rolling hills, the village and the buildings dotted around. The views over towards Lundy Island are really something very special. When I showed Mum the first draft we quickly put our heads together to create the image of Sloop and the other characters. Having similar ideas made it easy to work together; we bounced ideas off each other for the story and the illustrations. The books Mum read to me as a child by authors like Shirley Hughes and Jill Murphy heavily influenced the writing style and illustrations of Sloop. Places like Woolacombe and Morthoe are like those story books; they are safe and timeless and you could lose yourself in the world of the story or place. I hope that being set at the seaside and talking about holidays, days at the beach, school and friends that it will have something that its readers will be able to relate to. It has been a really good experience to work with my Mum on such a project, we will always be able to say, look what we did! Sloop has become very special to us both and it is lovely to see him go from strength to strength. I attended school in Wales and at the age of 15, not unlike many youths during the 1970’s, found myself surrounded by the media of great Hollywood cinema productions. Undaunted by the decline of the cinema in favour of television, we still believed it may be a good idea to make a movie. Together with my classmates we made a 35 minute 8mm version of ‘The Lost World’ complete with animated dinosaurs. The real challenge, a James Bond fan film was to defy school critics. However, we first required permission. A group of us crammed into a phone box as we called United Artist in London who answered “A Bond home movie? Well, good luck boys.” That was enough for us. This was to be a full length epic in colour and sound, costing a whopping £1.80p per three minutes of film. In today’s money that would be £35 and adding processing, would now cost thousands for a complete 45 minute movie. Selling all our worthy goods we set about planning our project which we estimated to cost £200. Tredegar House School in South Wales became our audition centre for casting and a Bond was selected. Well, me, of course! Our film unit was complete with a full production team including make-up artists, props and costumes. The leading ladies were played by then 16 year old Gail Healey along with Margaret Hogan who was already in amateur school plays at the time. Gail played the part of agent Angel May and Margaret ‘Miss Moneypenny’. The plot for ‘The Second Shot Kills’ is in true style of a renowned Bond epic. While searching for a missing South American agent, James Bond uncovers a plot to weaken MI5 through elimination. These ruthless killers begin a campaign importing illegal weapons into the UK and Bond becomes the bait to lure them into the open; however both hunter and prey risk falling for an angels beauty. At the time we were aware that we needed a perfect villain, fellow pupil Robert Keane was signed up and was a terrific character. Written by us, the scenes were filmed around city centres including London. The South American scenes proved obviously difficult and were abandoned, until now some 45 years later. Living in North Devon I occasionally walk along Woolacombe beach and gazed at the possible backdrop of Rio de Janeiro; it was perfect! Thankfully the original film was still in metal cans covered in dust and reasonably well preserved; I then contacted all the surviving cast to ask their opinion. An old friend Dave Harnett arranged a costly digital restoration of the old standard 8mm film and we were off. We set about buying vintage cameras from the internet including Kodak film from old 70’s stock. These films were stored in refrigerators and could be used to continue the same texture as the original film. It was vital that any new extra scenes using 1970’s designer costumes would blend into the storyline. We also had to find a new cast for a three minute Rio part and my daughter Dawn doubled for the leading lady, the match was perfect and the weather was magnificent! I constructed a camera dolly using pvc pipes and skateboard wheels, this was set up on a wide section of Woolacombe beach. Suitably dressed in Oxford bags Akram Mohammadu an anaesthetist from North Devon District Hospital played a Honduran spy; together with Dawn Stephens-Borg. The project attracted the attention of the distinguished North Devon actor Joss Ackland who offered to help in the sound restoration. He voiced the character ‘M’ head of intelligence instructing James Bond on his adventures, this added huge credibility to the film and a great experience for me to act alongside an outstanding artist. Dave Harnett and I have remained friends since school and realised that a full 8mm film is rare these days, especially one originally filmed by 15 year olds. 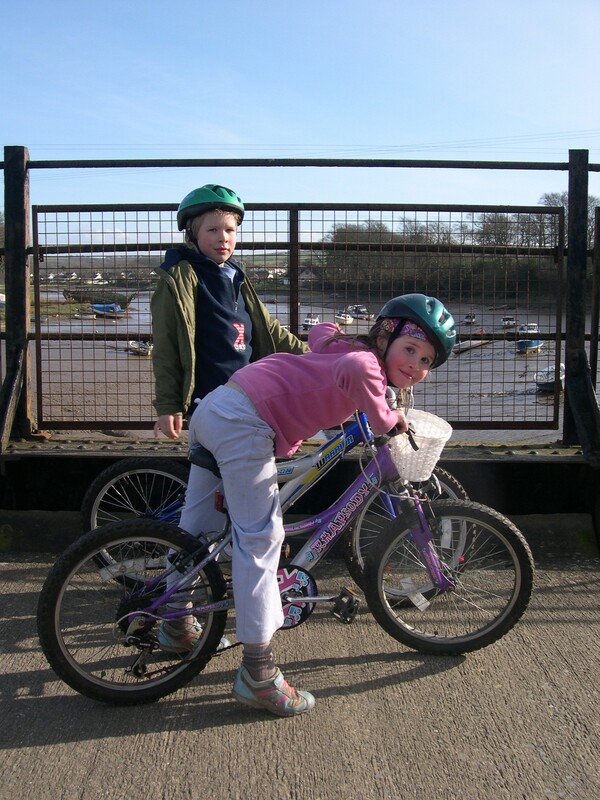 The Tarka Trail is a delightful pedestrian and cycle way which runs through the stunning North Devon countryside. The entire Trail is a 163 mile figure-of-eight travelling through landscapes little changed from those described by Henry Williamson in his classic 1927 novel Tarka the Otter. It is an invigorating and sustainable way to explore some of our stunning coastline, through deeply incised river valleys with ancient tangled woodland to the productive farmland and moorland higher up the catchments. Some sections of the Trail are also part of the South West Coast Path, the Two Moors Way and the Dartmoor Way. It is part of the National Cycle Network (routes 27, Devon Coast to Coast and 3, West Country Way) and the shared-use section between Braunton and Meeth is totally traffic free. Along this stretch, many interpretation boards and other information will help you discover the wildlife, heritage, culture and natural features along the route. To the south of Petrockstowe Halt, Devon Wildlife Trust have now opened Meeth Quarry Nature Reserve. 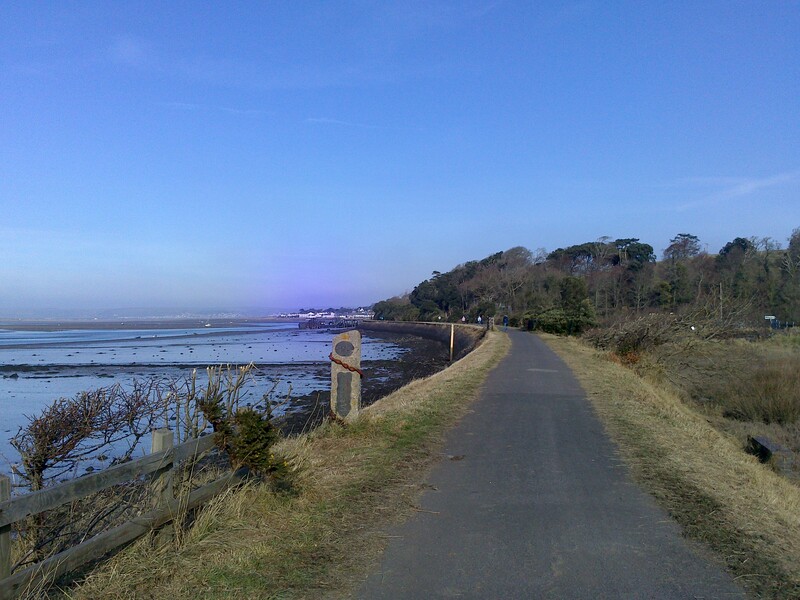 This exciting nature reserve can be accessed directly from the Tarka Trail. As the site continues to develop we think it will become a ‘must see’ destination. Tarka Trail: Circular Routes has been produced to encourage walkers to venture further on to the Tarka Trail in North Devon. This booklet promotes 11 circular walks along easy to followway-marked loops that take people off the beaten track into wildlife rich landscapes and remote villages and hamlets. There is something special about a VW camper. Is it the ageless charm each and every vehicle oozes, irrespective of condition? Or is it simply the feeling of freedom that allows the individual to ‘escape’? – Whatever the reason may be, it’s safe to say the famous ‘VW’ logo has touched many people the world over. To the casual observer, all VW campers are the same; not true. There have been many generations, the most famous being the split screen (The famous 60’s icon) and the Bay Window, which was a common sight on roads until late in the 1970’s. 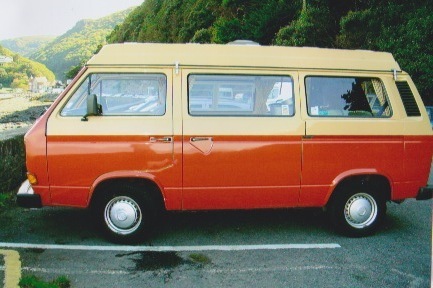 My own experience of the VW camper was in a somewhat newer form (in VW terms that is!) 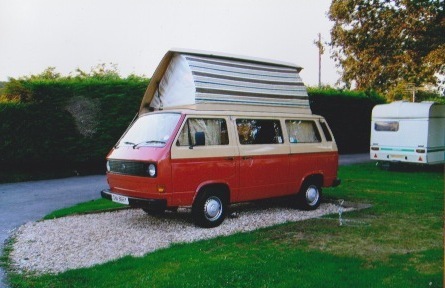 – I was lucky to have owned a 1982 T25 2 litre air-cooled Devon van for 2 years (Often referred to as the ‘Wedge’ by VW enthusiasts due to it’s square shape). We lavished him with a new paint job, Empi 5 alloys and rear jail bars for the windows. He looked smart and I have to admit, was rather proud when he received admiring glances! Our dog Hollie also made herself comfortable riding ‘shotgun’ to me on the front seat! Charley’s first trip out with us was a rather odd, last minute day trip to Woolacombe to get Sunday Lunch at The Red Barn! (Some may say that a 374 mile round trip is somewhat excessive…or indeed madness!) The truth is, I just wanted to drive him. This maiden voyage was both a test to his reliability and an excuse to visit Woolacombe; a place we both feel a special love for. Over the next 2 years, we visited both Woolacome and Morthoe on various camping trips – My favourite being at North Morte campsite where we enjoyed evening sitting outside the van with a drink, watching the sun creep down over the hills. This beautiful memory will stay with me forever. Ok – Charley wasn’t exactly what you could call perfect; his fridge didn’t ever seem to work, the wardrobe door had a habit of flying open whilst on the road, and his fuel consumption could be best described as horrendous. Strangely, none of this seemed to matter at the time; it was all about the surroundings and the ‘Dream’. The fact is, you either get camping – or you don’t! For us it was a reasonably cheap break with a sense of freedom attached to it. You could be packed up and on the road again with 30 minutes, only to seek out another view or attraction to visit – On the whole, it was a lovely experience, which I remember with fondness. Sadly, due to financial circumstances (I already owned a classic VW Beetle which I could not bear to let go!) Charley was sold and now safe and sound with his new owner in Edgbaston, Birmingham. For us though, this is not the end of the story. Although the van was sold, the journey is still the same. For us, the road is still the same. After all, once bitten…. All roads lead to Woolacombe!